Now that September has arrived I think I can almost hear my sweaters and booties calling my name from my closet begging to be worn, but it’s just not quite time for heavy layers here in Texas. That leaves me at the task of styling the ultimate fall transitional outfit. Season transitional looks tend to take some thought because Texas temperatures can be moody from week to week as the seasons change over. I’ve found the key to success to be wearing lightweight fabrics in fall appropriate tones and mastering the art of layering…like what I’m featuring in the FOUR fall transitional outfit ideas below for errands, girls’ night, and even the office. 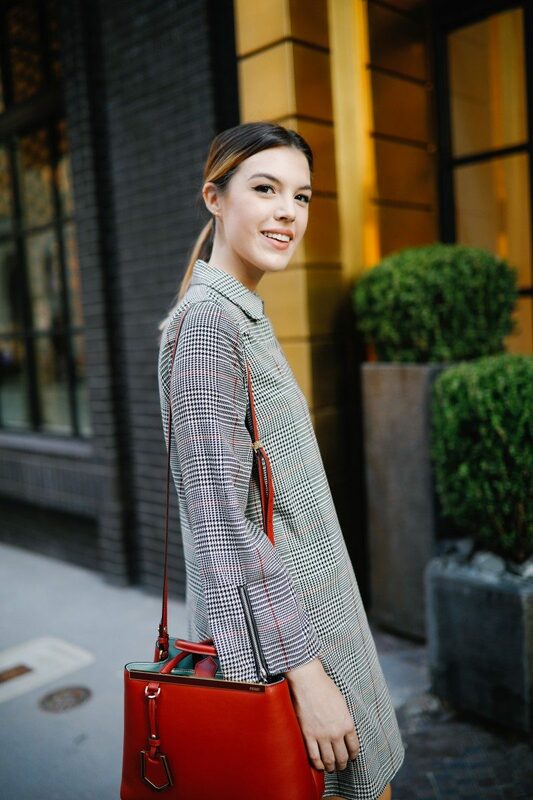 Checked Dress: I found this cute checked number at Zara last week, and I wore it to dinner with friends immediately that night! The cut, weight, and trendy pattern of this dress is exactly what you need as a base for fall transitional outfits. You can easily dress this up or down with loafers or block heel sandals. 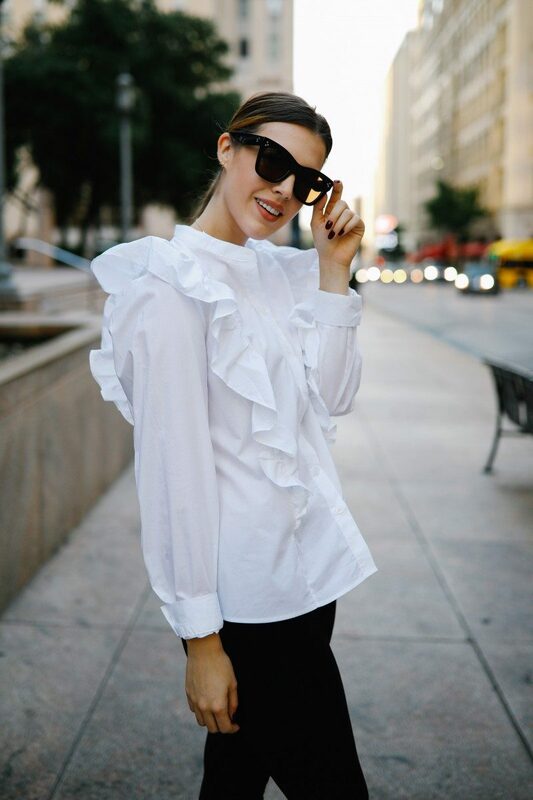 The loose sleeves and the polo collar keep things cool and lightweight (cotton and polyester blend) while the silhouette is a classic for fall looks. 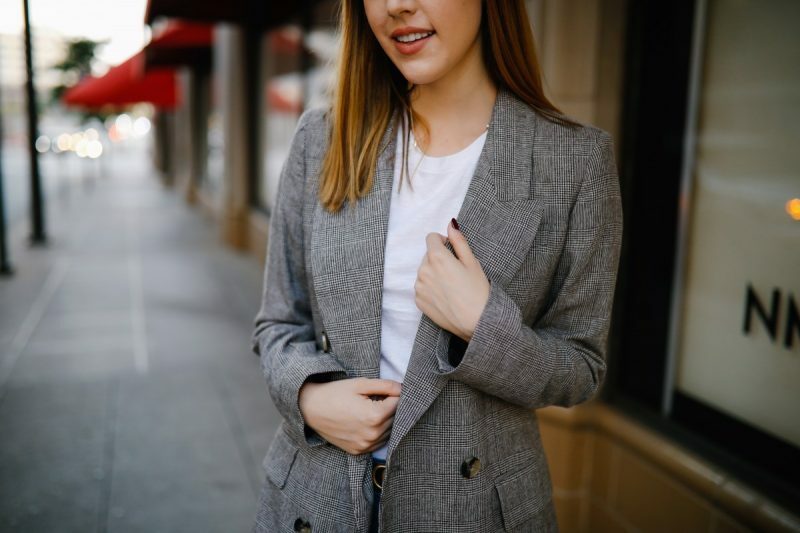 Blazer & tee: This outfit embodies lightweight layering that’s going to be an essential style trick to hone for the fall transition. I recommend pairing a super breathable tee with a favorite pair of distressed jeans because it’s an outfit you could wear out and about or to work even on hotter days. 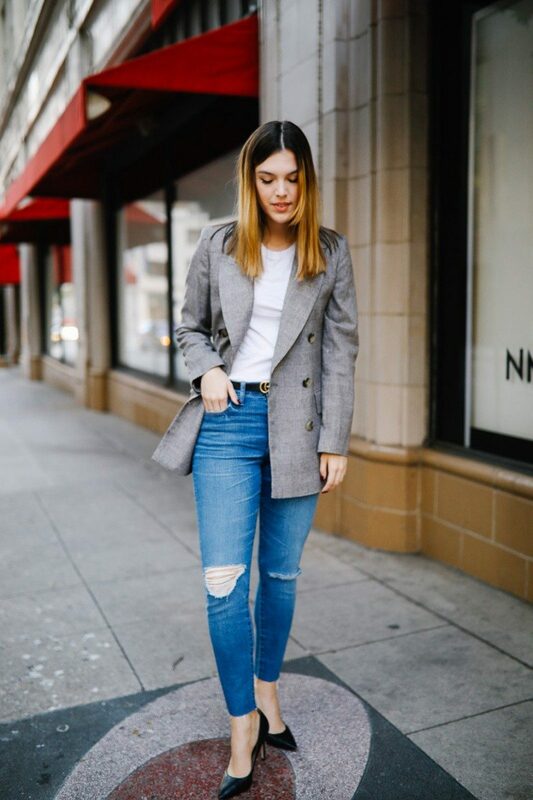 To keep the outfit fall-ready, I just draped or wore the blazer over the tee for a perfectly pulled together look that screams fall and is checking off the trend for a plaid double breasted blazer 🙂 ! I definitely wore open toe sandals with this look to keep things cooler and lighter weight, but I think it goes perfectly with a pointy toe pump for the office. Joggers & sneakers: This is a sneak peek of a whole outfit that I’ll be posting about later this week, but I had to share it because there’s no better genre of clothing to make fall transitional outfits with than athleisure. These joggers are super airy and you can easily pair them with a thin longsleeve tee or just your favorite tee in general. The sneakers give you a closed toe shoe if that’s more breathable and not to mention so comfortable. If you wanted to take this look from day to night, just drape your leather jacket over your shoulders. This will be a great go-to look when temps drop even lower at night! 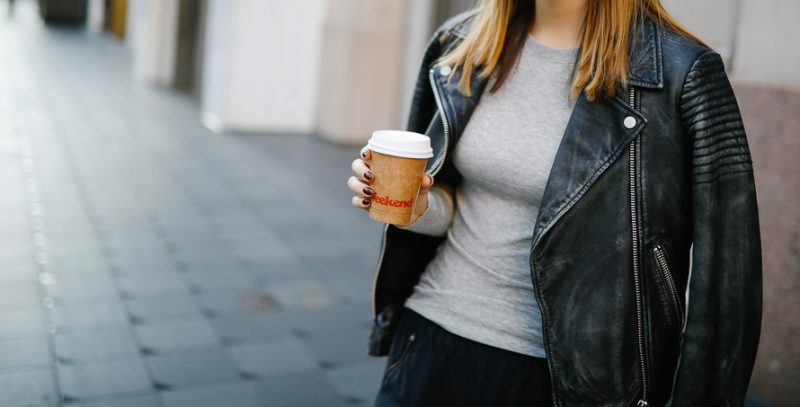 Trouser leggings (treggings): This just in: trousers are hot for this fall season according to my co-workers who just returned from fashion week (read about more fall 2017 trends here). And why not combine the season’s hottest trend with the beloved fit and comfort of a legging? This cropped trouser legging has been an incredible addition to my fall transitional wardrobe because it’s short enough to still feel cool but can easily be dressed up with a button down (my ruffled one is from Target for $28!) or dressed down with a sweater to accommodate the changing temperatures. And there you have it: four fall transitional outfits that you can start wearing now. What’re pieces you like to wear during the fall transition period? Looking for more fall outfit inspiration? Meet me over on Pinterest and don’t miss my board full of fresh fall outfit ideas! LOVE all your outfit ideas!! That Zara dress is just the cutest on you!